Yesterday I was at the store ostensibly to purchase felt and thread when I spied the yarn aisle and had to take a stroll and feel all the beautiful yarn. I of course had to purchase two skeins of soft yarn in navy and gold, and though I didn’t know what I was going to do with it, I knew I wanted to make something cozy for winter. When I got home I looked on Pinterest for ideas and found these beautiful hand warmers. They’re beautiful, warm, and small enough that I can probably make them in a few hours. I’m planning to sit by the fire and listen to an Agatha Christie audiobook while I crochet. 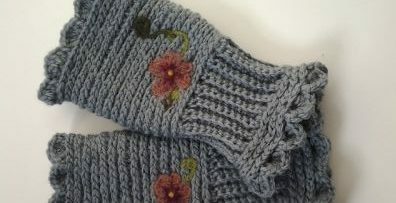 With something like these hand warmers, there are a myriad of free patterns available, but what drew me to this particular pattern was the simplicity of the pattern and the fun added touch of the buttons. They’re soft, elegant, and will go with anything I wear when I have to duck out for some soup ingredients. This is a great pattern for beginners, and if it’s a pattern you enjoy, you can make several pair of hand warmers in very little time. They would make great stocking stuffers for Christmas, or a lovely present for teachers, co-workers, grandparents, parents, kids, and neighbors (the pattern comes in sizes from baby to adult). Slugs On The Refrigerator’s pattern for these hand warmers was part of their Crochet Camp program, and if you want more patterns from them, I recommend bookmarking the site and checking back often. This particular pattern is available as a free PDF, and has plenty of pictures to illustrate the puff stitch used in a major portion of the pattern. If you haven’t tried puff stitch yet, try it out before attempting the hand warmers. It’s a great stitch to learn and one of my favorites, but it did take a little time for me to master. 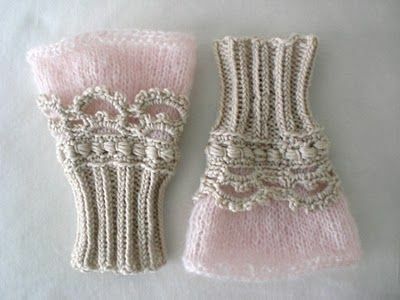 Making a pair of these handwarmers requires some DK weight yarn (the pattern suggests using wool), a 4mm crochet hook, 2 buttons (1 cm diameter), and some scissors. The only stitches you need to know are the chain (ch), single crochet (sc), slip stitch (sl st), and puff stitch. Yarn over and chain space are also used in this pattern. With only 9 rounds for the hand and 3 for the wrist, this project won’t take very long, especially after you get the hang of the puff stitch. You’ll be creating a loop for the buttons near the end, and once you’re finished with the crocheting you can weave in the ends and attach the buttons. Experiment with different types of yarn (wool can be a bit scratchy, but some others will not be as warm), various colors (variegated yarn vs royal tones or pastels), and buttons (toggles, wooden buttons, square buttons, etc.). Each pair of handwarmers can be unique and special to the wearer whether you’re making a pair of these handwarmers for yourself or a few pair for the family. If you’d like to make these cozy crocheted handwarmers, you can find a link to the free PDF on Slugs On The Refrigerator.